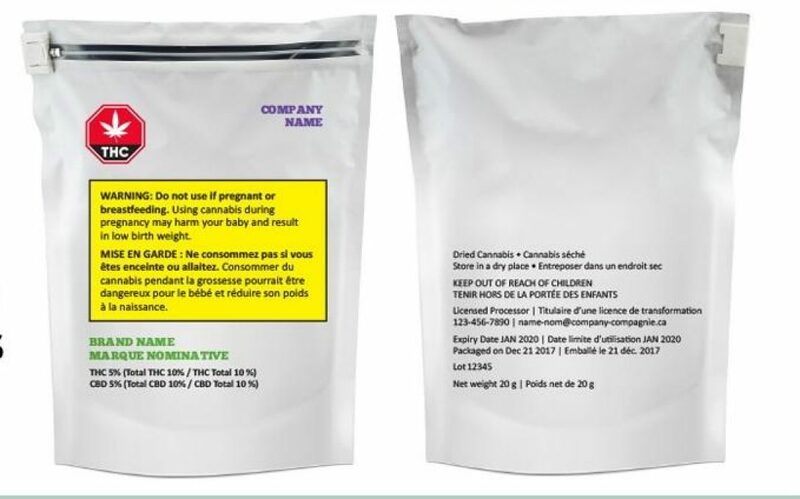 OTTAWA—Legal pot will be sold in plain packages emblazoned with a yellow health warning and a red stop sign stamped with the silhouette of a marijuana leaf, according to draft regulations released Monday by Health Canada. The proposed rules will allow for packaging to depict a single brand element beyond a company’s name — either a logo or a slogan — but which may not contain any metallic or fluorescent colours and must be smaller than the stop sign symbol. The stringent restrictions around marijuana packaging and labelling are contained in a report from Health Canada summarizing the results of a 60-day public feedback process the department began in November after its original regulatory suggestions. The consultation received more than 3,200 online submissions and 450 written responses, in addition to input from health and law enforcement experts, governments, patient advocates and marijuana industry representatives. The government’s focus remains reducing the appeal of pot among youth, preventing accidental consumption and informing consumers about the health risks of marijuana, Health Minister Ginette Petitpas Taylor said. “The red stop sign — it’s an alarmist type of sign and people are going to recognize that they have to be aware that there is cannabis inside this product,” Petitpas Taylor said Monday. Other governments and industry actors have been pushing Ottawa to release more details around its packaging and labelling rules in order to have enough time to prepare for legalization, she added. Legislation to legalize recreational marijuana is currently before the Senate, which has agreed to hold a final vote on the bill by June 7. Petitpas Taylor has said provincial governments will need another two to three months after that before retail sales can legally begin. The regulations will also require packaging to be opaque, child-resistant and have mechanisms to show signs of tampering, as well as a section describing the amount of active ingredients contained in the product, including THC and cannabidiol. Petitpas Taylor said she expects the regulatory framework Health Canada proposed Monday will be closely mirrored in the finalized version, which will apply to recreational cannabis as soon as it is legally available. The packaging regulations will also apply to medical marijuana but a Health Canada official said, in that case, manufacturers will have a six-month window in which to comply. Health Canada also proposed two new categories of small-scale producers — micro-cultivators and microprocessors — where lower-level security requirements would apply to businesses that grow or process smaller amounts of marijuana. The Canadian public broadly supports the tight regulations it has so far proposed for marijuana packaging, the federal government said.